But this year, things are different. With a new Creative Director on board, (Kate Gerova, formally Head of Distribution at Soda Pictures), they have an edgy line-up of films that I really want to see, from a region undergoing massive change. I’m amazed that some of these films actually exist. The Festival runs until 10th April at BFI Southbank, The Barbican, ICA and Hackney Picturehouse with a programme that includes 6 features, 9 documentaries, several short and silent films from countries across the region – Algeria, Egypt, Lebanon, Morocco, Palestine, Saudi Arabia and Syria. Some of these films may never screen in the UK again. I urge you to go and see them. *I did complete a feedback form with exactly that feedback on it. I didn’t win the chocolate. I first heard about Soad Hosni when Watch Out for Zouzou screened in a season of Arab films at the ICA cinema in London. The programme notes described her as the Marilyn Monroe of Arab cinema and it turns out that the comparison was apt in more ways than one. Not only was she a big star with a captivating screen presence and great talent, but like Monroe, her suicide was a source of endless speculation and conspiracy theories. Soad was born in Egypt in 1944 and made 82 films between 1959 and 1991. In 2001, she moved to London to recover from illness, but tragically fell to her death from a building in Edgware Road. Rania Stephan’s film is an unusual biographical portrait, made up entirely of edited clips from her films – a sort of feature length montage. Many of the clips are taken from VHS, so the quality varies, but the colour bleeding, the dodgy tracking and sometimes slightly poor picture quality create not only a great time-capsule tribute to the actress, but also a nostalgic nod to VHS. The loose plot follows Soad’s rags-to-riches tale and touches on her rise to stardom, her failed romances and her increasingly complex acting roles (perhaps mirroring changes in Egyptian cinema censorship and society). The result is highly original. A celebration of Soad’s cinematic image, rather than an in-depth look at her life, but a unique and fascinating experience. “I don’t like politics, but it knocks at your door”. Two years on from the uprising of March 2011, the fighting in Syria continues with no apparent end in sight. In the year leading up to the uprising, Yasmin Fedda was on the streets of Damascus with her camera, capturing some candid opinions from ordinary Syrians, something that would’ve put her life at risk had she continued. This is confirmed by eerie footage shot in February 2012 of a Damascus rooftop – a static shot with gunfire in the background and jet planes overhead. The cameraman has since been killed. The equivalent of a film thermometer, this is a fascinating way of taking the Syrian temperature. Yasmin focuses on two very different people – Botrus, a Christian monk living in a remote monastery and avid football fan, who works hard to improve interfaith relations within the relatively safe walls of his hillside settlement; and Salem, a former fashion designer and now an Iraqi refugee living in Damascus, who finds work designing and making clothing for friends. Both men are trying to live their lives as best they can under an increasingly oppressive regime and both speak openly about their thoughts on freedom and religious tolerance. But there is a female voice too, that of the director and editor. Yasmin Fedda, although not appearing on screen, notes disappearing institutions – a Qur’an recitation summer school for women is cancelled, a helpline for abused women goes underground. She smartly cuts from community debates about freedom of opinion to state TV messages and patriotic songs. Both men begin to feel a squeeze. Salem’s legal status expires and he is harassed and forced to move house. Increasingly paranoid, he changes his appearance and takes to wearing dark glasses. Botrus’ remote retreat gets a visit from state police. In some ways, this is a contemporary echo of Budayri, The Barber of Damascus – a Syrian barber who kept a diary during the mid-eighteenth century which chronicled the downfall of the Ottoman Empire. The diary survives as an important historical document and useful insight into what happened and why. Rather than use straightforward talking heads, the interviews take place in homes or on the street, so the imagery is equally compelling (some amazing scenery surrounding the hillside monastery). Scenes are intercut with shady shots of secret policeman lurking in busy streets and colourful street signs in support of Syrian president, Bashar al-Assad. This is a rare look at a country on the brink. A warm film with two very likeable and engaging interviewees, which makes the welfare of Syrian citizens all the more worrying. Dir Joana Hadjithomas & Khalil Joreige, Lebanon / Qatar / France, 2012, 93 min. What do you think of if I mention ‘rockets’ and ‘Beirut’? That question is tackled within the first few minutes of this quirky documentary when the filmmakers search Google images for ‘Lebanon rocket’. Inevitably, the search reveals pictures of war-torn Beirut, missiles, damaged buildings and soldiers. But this film is about a different kind of rocket. In the early 1960s, a group of students at Haigazian University in Beirut started The Lebanese Rocket Society. Led by their mathematics professor, the focus was on scientific research (rather than military advancement) and they eventually made the TV news and became a symbol of national pride. They produced the first rocket of the Arab world and there was even a commemorative stamp. In what sounds like science fiction (or an episode of MacGyver), they were unable to afford or obtain rocket fuel, so they made their own. The rockets got bigger and travelled further, narrowly missing Cyprus on one occasion. The project eventually came to an end and after years of war and upheaval, it was forgotten. Co-directors Joana Hadjithomas and Khalil Joreige have collaborated previously on several films (including I Want To See, starring Catherine Deneuve) and this is a pleasurable addition to their slate. Recording a moment of unusual Lebanese history using photographs and archive footage, the film charts the rise of the project, partly inspired by the Cold War space race, but also part of a fierce quest for technical modernity. Some of the images are very rare, as many negatives were lost or burnt during the 1967 Arab war and civil war/occupation of the 1970s and ‘80s, and the filmed rocket launches are stunning. Towards the end of the film, the filmmakers decide to further commemorate the project and install a replica rocket at the university. In a bizarre and surreal (and slightly forced) coda to the story, they transport the replica on the back of truck through central Beirut. Stunned drivers and pedestrians watch in amazement. What must they be thinking? If you search Google images for ‘Lebanon rocket’ now, you still get pictures of war-torn Beirut, but thankfully, several of the Lebanese Rocket Society and the documentary survive. A first feature from documentary filmmaker Leila Kilani, On the Edge definitely has a fly-on-the-wall feel to it and is reportedly inspired by true events. Two young girls, Badia and Imane, eke out a meager living at a shrimp factory in Tangier. Drawn to the city because of work, they spend their days in white overcoats and hairnets, while at night they hustle and steal in leather jackets and jeans. They fall in with two textile factory girls, Nawal and Asma, and together they plot the big heist. But this is more than a simple crime thriller, due in part, to a fascinating central character. Badia (Soufia Issami) is a twitchy, rebellious anti-hero (ine). Outwardly tough, she has a manner that borders on mental compulsion, frequently scrubbing herself clean and speaking in self defensive mantras (sounding a bit like Muhammad Ali before a fight). She trusts no one and is fiercely ambitious. She scrubs her skin raw to get rid of the shrimp smell, and maybe to forget that she’s a shrimp girl at all. For there’s a clear hierarchy in place between lowly shrimp factory work and the much coveted textile jobs in the Free Trade Zone. Using handheld cameras, the scenes flip between bright, clinical factory settings with white walls and artificial lighting (when the work is legitimate), and the dark, gritty nighttime streets of Tangiers. The pace is brisk with a growing threat from Badia’s ‘victims’ and potential double crossers as the girls become deeply involved in the crime underworld. 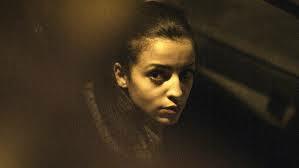 There are good lead performances from a young cast, particularly Soufia Issami as Badia. Although the character is difficult to like, Soufia’s portrayal is sympathetic and edgy. The Free Trade Zone is another interesting plot aspect. This is a gated area in Tangier where global companies can operate factories tax-free, which naturally attracts many famous brands as well as a large workforce of young Moroccan women like Badia and Imane. Although bringing lots of new jobs, the working conditions and pay are questionable. Overall, an illuminating look at Tangiers’ dark underbelly, probably not very popular with the tourist board, but an insight into global capitalism in Morocco and its effects on young women. Popular on the festival circuit, this film screens off the back of several awards including Golden Lion for Best Feature film at Algeria’s Arab Film Festival of Oran and Best Director from the Arab World and the FIPRESCI Award at the Abu Dhabi Film Festival. It’s easy to see why; this is an impressive, slow-burning drama. Thirtysomething Soad dutifully cares for her elderly bedridden father who has recently suffered a stroke, while her exhausted mother works night shifts at the local hospital. All three seem trapped inside this stuffy Cairo apartment and a state of lethargy has swept over them. No one wants to get out of bed in this house. Soad’s frustration begins to show and she decides to go out for just a few hours, despite her mother’s agitation. Once she’s out, accidents and mishaps prevent her from returning and she eventually end up staying out all night, wandering city suburbs aimlessly. A slow, meandering pace and long static shots reflect the boredom and monotony of Soad’s sheltered existence. The first half is set entirely within the family home, with actors often framed in doorways, sometimes lit from behind by the sunlight outside. Street sounds provide background noise – traffic, distant shouting, a crowing cockerel – a reminder that the world still exists outside the apartment. It comes as a relief, not just to Soad, but to the audience too, when she finally walks outside. There is no mention of recent political changes in Egypt, but I couldn’t help wondering if Soad was afraid to venture out. When she does, she seems lost and unsure. While the ending might seem a little anti-climatic, the story and characters linger. Incredibly, this is a debut feature from writer / director Hala Lotfy but it could easily pass as work by an accomplished auteur. She’s definitely a director to watch. Birds Eye View runs until 10 April at several London venues. Coming Forth By Day, A Tale of Two Cities and The Lebanese Rocket Society all screen on Saturday 6 April. The Three Disappearances of Soad Hosni screens on Sunday 7 and Monday 8 April. On the Edge screens on Tuesday 9 April.